Since school started, I have been having fun visiting students at schools all over Kherson. Several mornings a week, I go to different schools with one of the Librarians from the Department of Foreign Languages. We have a class with a topic like food or sports, give them information about the library, invite the children to visit the library, and have a question and answer session about America. We also have our English Clubs here at the library on Sundays. Many children come to the Club. We had 63 children last week. This fall, I have met almost 400 children. I love it when you say hello to me when I am walking around the city, and I wish that I could remember all of your names. As I get to know the children of Kherson, I am not surprised that they are very much like children in America. They are curious about the whole world, friendly, funny, full of interesting opinions, and ready to learn new things. They like the same films, music, books, clothes and celebrities as American children. They like to dance, sing, roller skate, ride bikes, learn martial arts, read books, play sports, games, musical instruments, computer games, chess, listen to music and surf the internet. Best of all, they have dreams for their own future, and for the future of Ukraine and the world. My favorite activity is when children ask me questions. The questions are always interesting, and it gives them a chance to practice speaking English. Here are some questions that students have asked, with my answers. “What do I like about Ukraine and Kherson?” This question is fun to answer because there are so many things that I like about Ukraine and Kherson. This country is very beautiful and Kherson is a pretty, green city with many parks and the beautiful Dnieper. The food here is delicious, fresh, healthy, and reasonably priced. Of course, what I like best are the warm, friendly people who have been so kind and welcoming to me and my husband, Steve. “Do I have any friends and family in America?” I do have many friends and family in America and I miss them very much. I have one daughter, three brothers, one sister, many nieces, nephews, uncles, aunts, and cousins. I also have many friends and my dog, Nugget. I do miss everyone but I talk to them on Skype and send e-mails so we can keep in touch. My daughter, who is 24 years old, will come to Kherson in December. It will be wonderful to see her and to show her around the city. One smart young man asked me “Do I read Newspapers?” I liked this question because this is one of the things that I do miss about America. In America, you can have the daily newspaper delivered to your house, so it is there for you when you get up in the morning. Every morning, I read the newspaper while I ate my breakfast, so I could keep up with all the news. Since my Russian skills are not good enough to read the paper, or understand much of the news on television here, I do miss knowing what is going on in the city. I do read American newspapers and the Kiev Post on the internet, but I miss having the newspaper in my hand and reading all that interesting information. So, if you have a question you would like to ask me come and see me at the library. I will be happy to answer your question and will have some questions for you too. I hope you have had a great summer. It was certainly hot, so it was a good summer for swimming and eating watermelon. Now it is time to get your school supplies and get ready to go back to school. With school starting, it is time for the English Clubs here at the library to start again. These English Clubs will be on Sundays, and the first day will be September 9th. There will be three clubs for beginning, intermediate and advanced English speakers. The club is not another English lesson like you have in school. Instead, it is a place where you can practicing speaking English and have some fun, too. You can also learn about America, from me and from some of my Peace Corps friends. If you would like to improve your English or just have some fun, come and see us at the Library on Sundays, starting on September 9th. I look forward to seeing all of the children who have been coming to the Library during the summer and to seeing new faces as well. Enjoy the last days of summer, get a good start at school, and visit us at the Library. On Friday, August 1, 2012, we did activities that helped us learn vocabulary related to sports. The Summer Olympics are happening now in London, England. Many of the children are watching the different sports on television. So we talked about the sports that we all like to do. These included football, volleyball, dance, martial arts, rollerblading, swimming, and skiing. Then we played a game where we identified the equipment that you need to do different sports. Everyone had fun and learned some new words in English. We also had some special guests. Darrell Francis and Lindsey DiLoretto are Peace Corps Volunteers who live in villages near Kherson. They made a special trip to the library to meet the children and do some activities with us. Darrell has been here before and it was the first visit for Lindsey. Darrell brought his special travel guitar. This guitar looks different from most guitars because it is small and light so you can take it with you on a train or a plane. Darrell and Lindsey have just returned from working at a camp at the Black Sea. 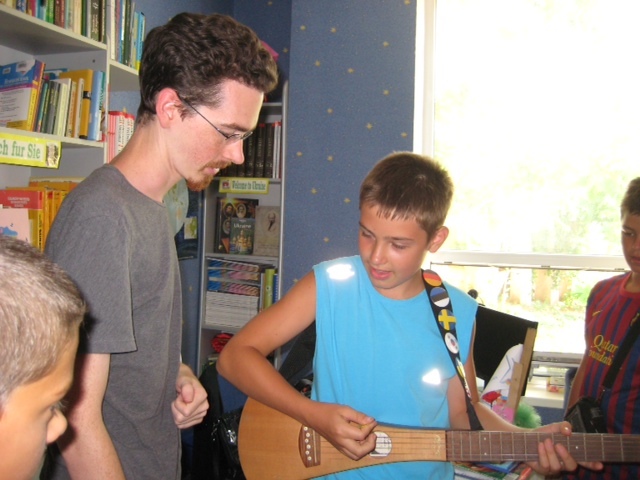 While they were there, they taught the children at the camp some songs that children sing in America. So we learned some of these songs, too. Lindsey taught us the words and then we sang along while Darrell played his guitar. We learned “You are My Sunshine” which is the official song of the State of Louisiana. It is very popular in America and everyone knows this song. We also learned “This Little Light of Mine” and another favorite with American children, “Old McDonald had a Farm”. We had a very nice morning, and we hope that Lindsey and Darrell will come back to visit us again soon. Last Friday morning, July 27, 2012, we had an activity about the English words for colors. The children were learning and practicing these words in English and I was learning the colors in Russian. The children are better at this than I am, and it is a lot of fun for them when I make a mistake. Of course, the hardest part of learning a new language is to speak. It is important to be willing to make mistakes, even if others laugh at you, so I do not mind. Colors are fun to learn because everything has a color. We played games with fruits and their colors, and with vegetables and their colors. The week before we had learned fruits and vegetables so this was a chance to practice these words again. Then we asked the children to tell the colors of their clothes. Summer clothes in Ukraine and in America are very colorful, so there were lots of good colors to name. In both countries, pink and purple are favorites for girls of all ages. English words with two “p’s” like purple and pumpkin are hard to say, so these are good words to practice at home. Boys seem to like red and orange. Another fun part of learning colors is using crayons, so we did a coloring activity. The children had to read the color words and then pick the correct crayons to finish their color palatte. All of the children did very well with this and had a lot of fun. Summer fun will continue on Friday at 10:00AM in the Window on America Room. This week we will have a special guest from America and we will talk about sports in honor of the Olympics. Ukraine already has some medals so keep watching the Olympics and come visit us at the library on Friday morning, and tell us how many medals Ukraine has won by then. During the summer, we have fun all week at the library. On Fridays, we have a special activity in the morning. On Friday, July 20, 2012, we played games and colored while learning the English names for the fruits and vegetables that are so plentiful and delicious here in Kherson. The children took turns saying the English names like cucumber, cabbage, watermelon, and peaches. Of course, everyone knows lemon and banana, but some of the other names are difficult to say and to remember. While the children are learning the English names, I am learning the Russian names. Some of these are hard to remember also, but a few, like kapusta, are used in America by the many different ethnic groups that have settled in America. Most of the farmers where I live in Massachusetts, are from Poland, so they love their cabbage, potatoes and tomatoes just like Ukrainians do. The growing season there is too short for melons, so we get those from other states that are further south. We do have plenty of strawberries, raspberries, blueberries and wonderful sweet corn, eggplant and cucumbers. By this time of year, we also have so much zucchini that everyone with a garden is trying to give it away for free. We also have many, many orchards growing all different kinds of apples. These will be ready to eat in September and October. Back at the library, we finished up our Fun Friday with a coloring project. The children colored a picture of a basket of fruit and vegetables and then matched the produce with the English names. They all did a great job coloring and were able to identify the fruits and vegetables, even the kiwi! So come and visit on Friday mornings about 10:00AM if you want to have fun and practice speaking English. When school starts again in September, we will again have English Clubs on Sunday, so watch for news about that. 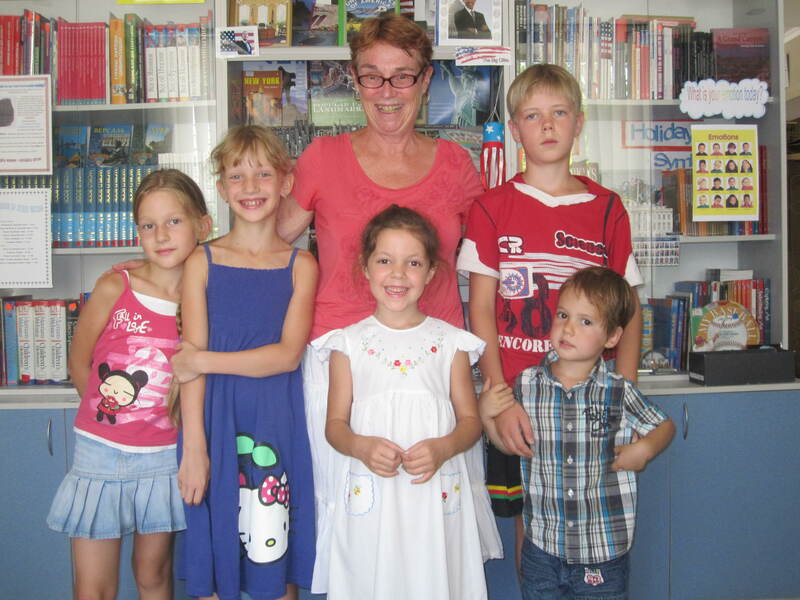 I am Mary Beth Phair, the new Peace Corps Volunteer at the Window on America Center for Future Leaders at the Kherson Library for Children. I will be working at the Library and living in Kherson for the next two years. I came here from America with my husband, Steve. I am getting to know my way around Kherson. I really like your beautiful city. I ride on the Marchutka’s, go swimming in the river, shop in the bazaar, and watch football on TV. I lived in Belchertown, Massachusetts, a small town of about 12,000 people. It would probably be considered a village in Ukraine. I have one daughter. Her name is Molly and she is 24 years old. She lives in Washington, DC. Molly works as an accountant. Stop by the library this summer and we can practice English together. When school starts in the fall, the English Clubs will begin again. I look forward to meeting you and getting a chance to learn about each other. 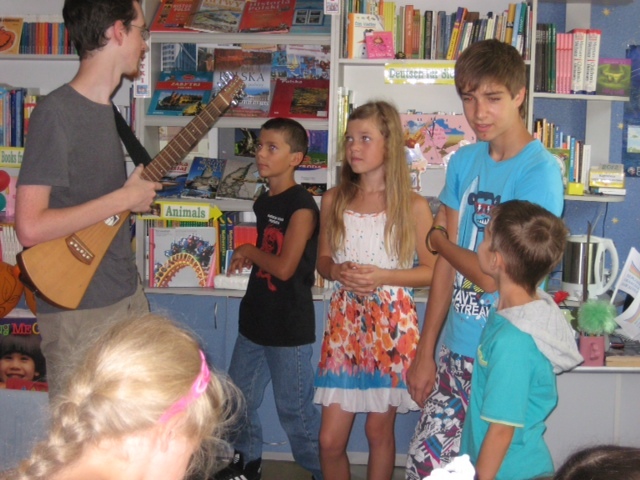 On Thursday, June 14, 2012, the Kherson Children’s Library was a beehive of activity! We were happy to sponsor a wonderful event for the participants of two camps, a Leadership Camp for teens and a Sun Camp for local children. The campers arrived at the Library around 9:30 AM and began a Quest for information on sports and healthy lifestyles in two city parks. The Quest was a contest between the two camps, with one group starting at Slava Park and the other at Lenin’s Park. Library staff, local celebrities and volunteers were positioned at different stations around the parks, with activities planned to test the athletic and brain power of the campers. It was a beautiful, sunny day and everyone was ready for some fun. The Stations had to be completed in order, so that the teams could progress through the Quest, with the goal of being the first group to finish all of the Stations and return to the Library. Stations included balloons with questions to be answered about Football, leaves hidden in trees with questions about healthy lifestyles, and exercises led by a boxer. All of the campers worked hard to complete each station, with plenty of fun and laughter in the process. Our celebrity quests included a boxer, a sports journalist, a traveler and healthy life style expert, and two Peace Corps Volunteers. The local TV station followed us on our Quest and interviewed the campers, the celebrities, and the volunteers. Soon it was time to return to the Library with the sports part of the Quest almost complete. The Leadership campers were the first group back, and the Sun campers were not far behind. When everyone arrived in front of the Library, we had a Flash Mob, with campers, library staff, and our celebrities participating in an exercise and dance routine with lively music to get us in the mood. Then the whole group moved to the cool comfort of the Pink Room for a session of Library Ping Pong. Awards were given to campers who had outstanding participation, and all campers had a chance to ask questions of the boxer, sports journalist, traveler and healthy life style expert, and the Peace Corps Volunteers. The children really enjoyed “interviewing” the experts and asked thoughtful and interesting questions. The morning ended with a chance for everyone to sample a delicious cake, made only of natural, unprocessed, and organic ingredients. This cake was baked especially for the library to help the campers understand that you can have a healthy lifestyle and still enjoy treats that are good for you! Everyone agreed that the Quest was a great success! We had fun, got some exercise, learned a lot and made new friends. It was a great way to have some summer fun!